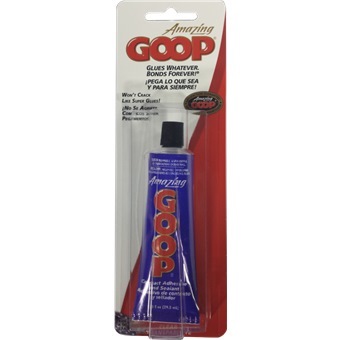 AMAZING GOOP ALL PURPOSE 29.5ML is rated 5.0 out of 5 by 4. Seals with a flexible, waterproof hold. Won't crack or break like super glue. Withstands heat up to 150°F / 66°C. Seal worn or cracked water hoses. Repair broken ceramic flower pots. Fix and tighten loose towel racks. Adhere new handles onto garden tools. Rated 5 out of 5 by lspua from Happy to get Shoe Goo at a cheaper rate Self collected the items myself at Kaki Bukit. Use the Shoe Goo to repair my badly demaged Vibram shoe. After repair, my shoe can be worn to run 15km. Good service from Horme. Rated 5 out of 5 by avrel13 from A useful item. Very easy to use and apply to almost anything. Use it on my RC Cars. Rated 5 out of 5 by Sam1975 from Great product and good location Was very convenient now to self collect from big box! Thanks horme! Rated 5 out of 5 by Kohym from The best glue so far It fixes a puntured airbed, my son's shoe, a broken sea shell ornament, a loose led light. So far it hasnt failed.